William Baldwin, Kurt Russel, and Robert De Niro all as firefighters, yea ok. The movie tells the story of a group of Chicago firefighters at Engine 17, two of whom are brothers. Lt. Stephen “Bull” McCaffrey (Kurt Russell), the elder brother, is obsessed with the beating of the fires that he fights. He is always at the heart of the fire – the most dangerous part of the fire. During their life-saving, their also on the trail of a serial arsonist who sets fires with a fictional chemical substance, trychtichlorate. When I first heard of the film and saw the poster I thought it was gonna be all about these firemen in their daily lives of fighting fires and how they do in their spare time. Instead I got a story of jealousy and sort of like a detective story. But despite this the movie is still great to watch and follow. This film if not about firemen but more of fire itself. The fire scenes are great to watch especially with special effects used with the fire itself. Their is a sort of life giving to the fire and you can feel the gritty authenticity of the fire. The cast is very star-studded but not used very well. Their are not enough scenes with the firemen just being firemen and we couldn’t get a full picture for each picture. Kurt Russel who is very underrated in my opinion does a very good job capturing the total aggressiveness of Bull McCaffrey. William Baldwin although is very awkward and dosen’t look like he fits in with the the rest of the cast. The scenes with De Morney and Russel are actually very well-crafted and it makes it all feel real. I thought De Niro was very misused and I thought he was just put in to put his name on the poster. Donal Sutherland who plays a psycho named Ron actually does a very good job as well and actually brought something to the screen every time he was on. The second part of the films which soon jumps into the detective story of the finding out of who caused these fires. I personally thought this part was not needed, or been used in a better way. Still this film is more exciting and fun than true and good. The exciting fire scenes make this film a great watch but other than those scenes, everything is just bland. 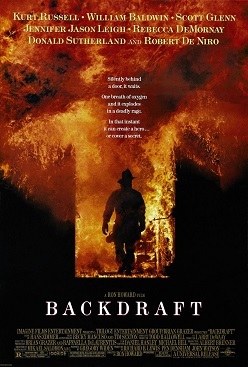 Still its way better than that bore-fest Ladder 49.
backdraft is one of my favorite movies from ron howard and kurt russell. better than ladder 49 and saving private ryan. i still love kurt russell in any movie and this is one of the. ron howard did a brilliant job. i still love kurt russell in any movie and this is one of them. ron howard did a brilliant job.